When the ureters enter the bladder, they travel through the wall of the bladder for a distance in such a way that they create a tunnel so that a flap-like valve is created inside the bladder. This valve prevents urine from backing-up into the ureters and kidneys. 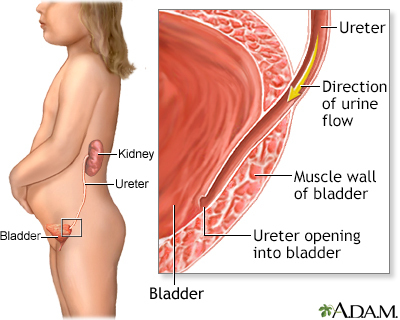 In some children, the valves may be abnormal or the ureters in the bladder may not travel long enough in the bladder wall, which can cause vesicoureteral reflux. Vesicoureteral reflux is a condition that allows urine to go back up into the ureters and kidneys causing repeated urinary tract infections. The reflux of urine exposes the ureters and kidney to infection from bacteria and high-pressure, which is generated by the bladder during urination. If left untreated, urinary infections can cause kidney damage and renal scarring with the loss of potential growth of the kidney and high blood pressure later in life. Vesicoureteral reflux is treated with antibiotics, and in severe cases surgically.